So I had my own piece of constructive feedback for tech conferences a few weeks ago. Okay you may call it a rant. It was close. Actually it was. For a good cause. Diversity. As a blogger I could just lean back. Now it was time for my action. 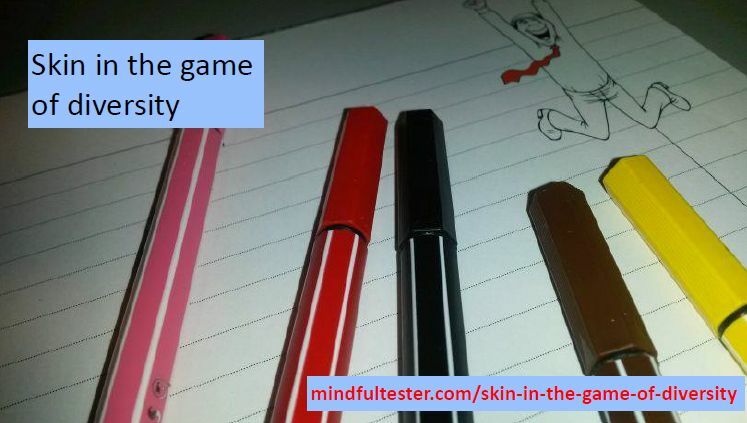 Skin in the game. There was one female co speaker. That makes two female co speakers. Wait. Now let’s look at the incredible number of female keynote speakers of 0. 2 times 0 makes 0. If this would be quadrupled or octodupled, it would remain a disappointing 0. In my experience there are more great female testers than 2 in the Netherlands. Let’s give them a place on stage. Main stage please. Thanks in advance. In the past no correspondence was possible about the proposal selection process of this conference. Discussion takes time especially with Dutchmen. So a bit of transparency might help. My first tweet to the conference was a wish for 2018: more female speakers than in 2017. No reaction at all. That was my target practicing. Next. Now let me stress that I am impressed with the test experience and knowledge of these keynote speakers. Now imagine two female keynote speakers and my reaction would be double wow. My friendly request to the chairman was to have a look at a list of female testers in case of keynotes. The answer was considerate: some of the ladies had already spoken as keynote speakers, but he would try to get other ladies on stage. My tweet had an unexpected side effect, which I had not anticipated. A case of collateral praise. One female speaker reacted with “cool and Very proud” to be on this list. A few weeks ago Rosie Sherry pointed to a whole discussion about #PayToSpeak. As a speaker it is the norm to pay your travelling and accommodation costs. Both Rosie and I don’t like this. I reacted with a Balanced Conference Card. Just answer enough questions with Yes and you have a balanced conference. “It is an inside joke. Anyways my blog post ended up in the newsletter of Ministry of Testing. Thanks. A week ago there was another discussion about female speakers. I pointed to my blog post. Somehow I ended up as an ally. Next tweet target was a huge European test conference. You know: this size fits only one in Europe. I actually was hesitant to send a tweet, but a disappointed tweet of a famous tester about another male lineup at a conf pushed me out of my comfort zone into my action zone. The program chair had no Twitter account. A few years ago this was already mentionable according to his track chair. So I picked the conf itself. I thought it was good to praise the conference organisers for actions taken for a diverse lineup this year. The aforementioned famous tester was also pleased with the steps taken in the past. So I retweeted her reaction with the request to keep up the good work. This left an unaddressed program committee. I tweeted a female member of the program committee to repeat the success of diverse lineup of this year. She did not react. The conf did. Gender bias was taken care of by making the proposals anonymous. Reads good to me. Make a compliment and/or request. So if you want to have more diversity, you have my permission to use these actions. Excuse me for scaring you. Conferences want praise from their attendees. So give New Voices a stage like Agile Testing Days. You know what: those first time speakers have a lot of keynote potential in themselves. Bio 1: I am a white male speaker. My dad sent me to the best schools and universities, because he could afford it. I now work at a Fortune 500 company. Bio 2: I am an African American woman. I grew up in the Bronx. We were really poor. The only times we saw a computer it was on the television. One day I was invited by Per Scholas. They thought I was bright. I laughed. They suggested something with computers. Me and computers, I could not stop laughing for 1 minute. It was not that difficult to pick up things. It was logical. For me the time with Per Scholas was like a Christmas story. After school it would be back in the shop selling veggies. You know what. I got a good job offer. Ain’t that great? Of course I am biased, if I see those bios. A very influential tester once told me, he would like to follow the Per Scholas course. And he is already good. These days I have to learn a lot just to keep up. What could this woman teach me about struggling and keeping faith? I want to see the underdog. Okay recruiters, don’t send me mails now. I have a disappointing message for you. Both bios are fake. Because this is a thought experience: you know like imaginary or hypothetical or dreamed up. Now what is all that stuff about skin in the game? Good question. Which needs a good answer. If I get accepted by a tech conf and there is big unbalance, then I will bail out. This talk will be dearly missed on my CV and my Conference Speaker Bingo Card, but that is my skin in the game. I am going to submit to 2 #PayToSpeak confs in the next few weeks. Although I don’t like this. One conference is part of yearly package deal membership under 100 Euro. This club offers a lot to the testing community. So I give something back. One conference is so nearby I lose a small amount of money for travelling. I can sleep at home. And I want break my streak of speaking every other year. In the meantime I have this, a blog to practice my speaking skills. This year a woman thanked for joining a group of attendees at a tech conference. I forgot it, until social media showed a lot of interest in bad behaviour. I planned to post this post weeks later, but the stories became more unbelievable as time progressed. One female speaker blogged about an invitation to share a room with the event organiser. Another female speaker did a remote talk after receiving death threats. Last week a whole discussion on Twitter started about paying speakers. This basically means that not all relevant voices are heard because of the costs. According to me that is bad. I’ll write later on why. We live in an unbalanced world. We live in a time, that we need role models, who look like us. We live in a world, where talent still can be found. These are some questions for conferences to provide better balance. Are there any pictures of attendees and speakers? Are there differences in gender and colour on these pictures? Would you be comfortable with them? Were any incidents in previous conferences handled well? Has the program committee women and men? Are there is a good mix of consultants and perople who are not consultants in the committee? Are pictures shown of speakers from previous speakers? Is help provided with the proposal? Is it clear, what kind of talks are asked? Is it clear, which costs of the speakers is being covered? Does the conference cover all costs of the speakers? Are special slots for first time speakers? Is help provided for speakers? Are keynote speakers female and/or people of colour? Is it clear, what you need for a session? Laptop or Java knowledge. Is the level or the talk clear? Is clear speaker info provided? Is speaker information only sent to the speakers? Do you have all information to give your talk before you enter the conference centre? Is it clear, who the track chair is for the presentation? Does the track chair support the speaker before, during, and after the talk? Are the technical facilities taken care of? Is the Code of Conduct used? Great example is Agile Testing Days. Is there room for questions? Is it possible to talk to the speaker after her or his talk? Are relevant actions taken to provide a more balanced program? 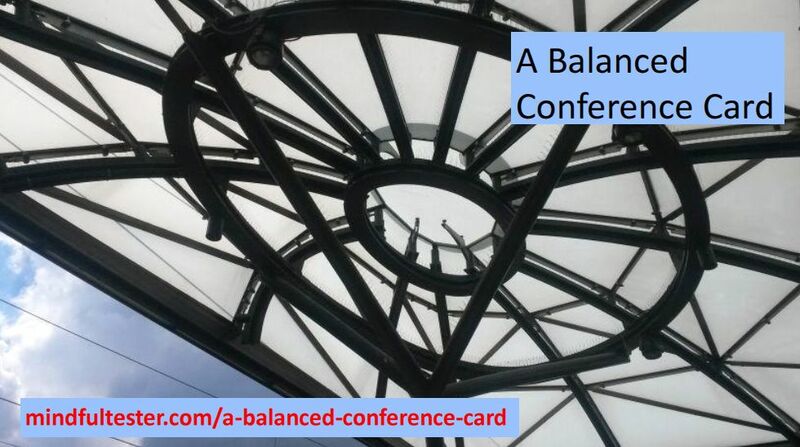 How do we know as conference organisers, whether the conference is balanced? There is healthy number of yes. Is it safe to organise? If you want a dev conference, I understand live coding sessions and an occasional manager with useful tips for devs. For a C level conf – only people with Chief in their job title – I expect only high level speeches. A coder with the right level of abstraction might fit in. The target audience is something to think about. Why is there so many fuss about #paytospeak? Let’s suppose I get accepted by conference in Italy. They offer me a free ticket to the three day conference. That sounds quite generous. I would not be surprised to spend 1000 Euro just for speaking. This sum might increase, because conferences often take place in touristic places. So I could go to my employer, but my budget is limited. I once paid all my travelling costs and I was really lucky that accommodation and food was included. If I would be accepted for 2 talks at tech conferences abroad, I have to use money on my saving account. So it is pretty costly to talk abroad, if these are #paytospeak conferences. I have to pay to speak. I don’t even break even and I will lose money. And I don’t bill all the hundreds of hours I spent to get a decent talk. Now I gonna write something weird. Suppose I have a new revolutionary way to test software and I would speak at all #paytospeak conferences abroad, then my bank would really notice this within a year. Even if I am a keynote speaker. Do you know that story about the white male project leader, the yellow man and the African European woman? No. Okay. The white male project leader, the yellow man and the African European woman entered the conference centre. In the keynote the white male project leader gave his extended pitch about the context. Then I, the yellow man, blew the minds of the audience telling about a multi dimensional test model. The African European woman remained seated and she deserved a place on stage. Months earlier In my second week on the project there was something harsh in the air. For months the team had struggled with this software test model. The progress was low in the previous weeks. The male project members were starting to grind their teeth, when the African European woman politely requested to test two models. There were still grunts, but the other project members eventually gave in after friendly words from her. So the project team split in two sub teams using two different models. At the end the outcomes were compared. The result was almost the same. Her model was the most easy one to use. The team spirit was back in town. In that same week I got my Eureka moment. I could make some nice extensions to the model. Think about third and fourth dimensions. I only needed a push and she provided that. One project day I met her. She was all smiling. She told me about a presentation of the model to her team mates. They were very experienced testers and they could not believe that the model was feasible for their context. She just answered all the questions all alone. And I had missed all the fun. This is the story about an African European woman who used her kindness to save a project. This story is also about cultures. This is something I want to share with you the reader. This year Marcel Gehlen explained the zone of proximity to me. If someone is in my zone of proximity, then I can easily tell how things can be done. 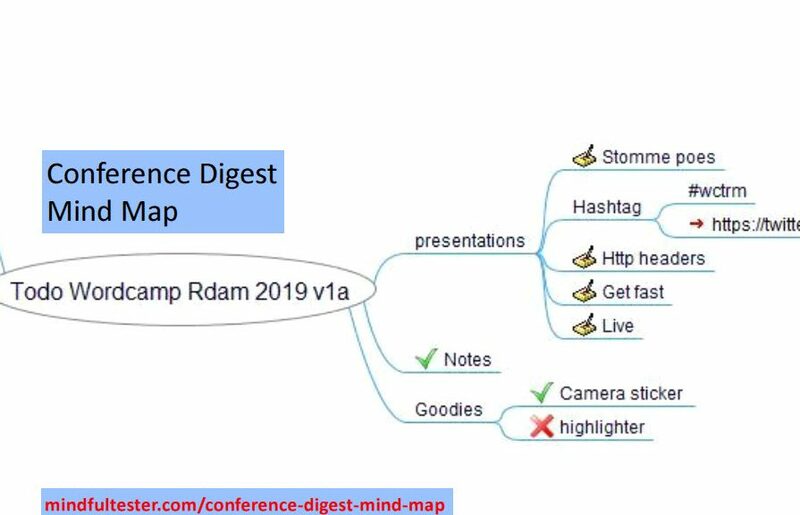 An example, if you are an experienced tester and familiar with mind maps, I can point you to Test Insane. Most conferences tend to choose speakers with years of experience: a decade minus or plus 5 years in the subject. If I am unfamiliar with the subject, then there is chance that I don’t understand the speaker. I would call it a case of different proximity zone. One evening I was browsing through a blog post. The same kid showed attention, so I showed a Visual First Person Customer Journey. Sorry for the click bait. I could not resist it. I just had entered the kid’s Zone of Proximity. Let me change the situation. I have to tell about my struggle with Test Driven Development in the first years. The first year I can really recall all the pitfalls I fell in. In the second year things become natural for me and the impact on TDD starters is becoming less and less. Basically my story has an expiry date. It will be lost unless I blog about it. Experience does not always count. Warning: some absurd situation ahead. At the beginning of this month Cory Foy had almost no female candidates for CTO. He just tweeted and got 27 awesome candidates. And counting. Focus on conferences again? Good, keep this in mind. In case a conference organiser still cannot find good female testing speakers, I honestly won’t understand it. This year an upcoming female speaker asked a #paytospeak conference about, how costs could be compensated. The answer was none except for keynote speakers. She was in the right league, so she asked for specifics. The conference answered that there was a limit. This could be called reasonable. Unfortunately the limit amount could not cover the trip from New Zealand to Europe. This lady is one of the organisers of a conference in New Zealand which covered travel and accommodation costs for all speakers. Including one from the UK and one from the USA. This year. Also this year. A female speaker had a question about a compensation for a co speaker. She wanted to talk about pairing in software development. The conference answered that only one speaker would be compensated. Now you can argue, that pairing cannot be demonstrated by a single woman or man. This lady happened to organise a conference which compensate the costs of all speakers, even the co speakers. BTW on Twitter I already saw one relieved female speaker of Euro Testing Conference. The plane tickets were compensated two months before the start of the conference. TestBash has also great compensation for speakers. It was updated and republished after the #paytospeak discussion. It was late in the evening, but the disco was packed. People were dancing on the floor having a good time. Some young women were approached by men. There was no contact, so another man tried, retried, and retried again. I knew these women. As a man I had to do something. Slowly the volume of the music went up for me. I noticed that people were dancing. The following day one of the women thanked me. Apparently I had done something right. A few months ago a speaker told about his experiences at a conference. He had difficulties to make contact. One of the responses intrigued me. Mohinder Khosla mentioned CITCON in Amsterdam. For a Dutchman this was interesting. The price was also reasonable 0 Euro with a modest request to cover the costs. But how could I determine whether the price was right? Among the participants I noticed Gojko and Cirilo. Wow. Then I read a recommendation of @testobsessed and I was sold. I mean the ticket. Not bad for a conference with a marketing budget of 0 Euro. Before I want to describe, what happened, I have a small warning. This post will focus on the process and not on the content. The reason I chose to is simple: people came there to share information and difficult situations. So reader beware. 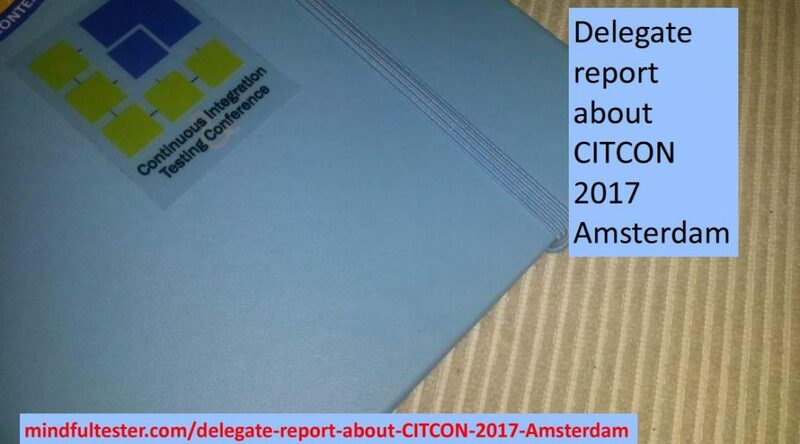 Now it is my task to draw you in the atmosphere of CITCON 2017 Amsterdam. The first day I used public traffic to go to the venue. It was hosted by Xebia. This office had all the elements to affect people’s mood. There was a standard meeting room with glass walls, a comfy corner including sofas and game computer. Did I mention the TV? There were rooms where I could see concrete shining through. Evening 1 started awkward. I only knew one participant and he was not present, so I talked with new people. The talks were friendly with a formal undertone. Really polite. Just probing around. Jeff and P.J. started the conference in a room with more than 100 seated people. They casually introduced the format. Asked for feedback (“5 stars is good.”). And let all participants introduce themselves and telling about things they were excited about or personal struggles. Those small stories let me connect to the people telling them. The subject proposal session was described. At the moment everyone felt at ease P.J. and Jeff told, that they would take a step back. They would only help in case of problems. It was “your conference”. This lead to an extension of the Q&A. After the last question the organizers withdrew from the flip boards. It was up to us, the delegates. After the warming up the real stuff started people were requested to pick a subject and clarify it to the audience. A queue formed in the room. People with posts its interested in solutions or volunteering to share information. I watched the process for a half hour and I noticed the time. Time to send text message to my family, that I would come home later. I really liked the way, how the subjects were presented. The question part was really clarifying. Participants tried to understand the content. The atmosphere had changed: it was warm and people were supportive. “Why do you call it ‘Blogging as a service’”? BTW there was also a session proposed “What’s in it for me?” It was listed In the final program. After the subject proposals I voted and went home. Afterwards I heard from a fellow Dutchman, that he was requested to compose the program. He kindly declined. He had already arranged the venue. This was a reasonable excuse. The next morning I entered the office, where I had a small chat with Pati about conferences and IT. I skipped my second breakfast and collected a good coffee. There was a friendly buzz in the air. I went to the program and browsed through the stickies on the flip boards. My session about blogging was accepted. Yay. Then the bad news sank in: there were too many interesting sessions at the same time. That happened to me years ago. I arrived early for the first session. I remembered that several stickies or subjects were combined. The room was quite big for the small group. I moved my chair to the middle of the room for better interaction. The first session was about testing and I tried to participate as good as possible. I had to watch my politeness, but I had no time. The subject was too interesting. I bent slightly forward and started contributing. I was in business mode: polite and helpful. For the second session I had to find the stairs. Glass walls wrre exceptionally handy in this particular case. The previous session was still in full swing. I put me in the background, while observing the room. Sofas. These are great: It is difficult to maintain a neutral position. So I had an extra indicator for inclusiveness. So I was in my session about blogging. And someone else. Okay time to start the Q & A. There were good questions. I got other questions than expected. Those made me think and reflect on my actions. After a while other people joined. They had used the Law of Two Feet. If delegates were not interested in their session, they were allowed and encouraged to change the session. For my session it was welcome. During the lunch people were still having sessions. One session was about strange effects of particular Unicode on programs. A bit too tech for me. You might have noticed that I changed the category to ‘Techies conferring’. My first thought was, that CITCON was about testing, until I read the description. It was about integration and testing. Other technical people would also be present. During the lunch I joined a conversation about 3,000 pipelines. This was another world for me. So I had to drop my idea of an extremely small set of pipelines. There can be more than 1. Writing about the afternoon let’s switch sections. After the section switch I try to stay of content, but that is difficult. One participant told a story about switching lines in code in order to cause bad unit test results. If the unit test did give an OK, there was likely a bug in the unit test. I also saw some really awful Gherkin to describe actions instead of abstractions. Gherkin is good for testing of flows. For tabular stuff FIT of Fitnesse are the tools to use. And Concordia is another good option for the remaining option. Thanks Gojko. For one of the final parallel sessions people were requested to bring real life testing problems. I joined this session. The facilitator did a good job to clarify the problem. A lot of whys and whats. I thought I could handle a lot of testing problems, but these were really hard to solve. I volunteered to take a picture of the stickies. My hand went to my pocket and stopped. The location had been changed. I had been warned. So I warned the other and up we joined the session in progress about Gherkin. You might have read about it. Some centimeters higher. After the session everyone was gathered in a room to share their AHA moments. There were a lot. I saw people who showed emotions. I saw people ready to take action when they would be back in the office. People referenced to the ‘Gentle punch in your face’ session with Jeff. Other people had some great conversations. Outside in the sun. Hopefully a dev snd a tester. The truce is out there. With more than an hour travel time and past my dinner time I had to find some place to eat. “It always works out.” Jeff reassured the people. Indeed a big group assembled on a terrace enjoying snacks, French fries, and burgers. They even had veggie ones. I talked with other testers, who knew about context driven testing and cynefin. I don’t meet these testers very often. “Me too.” another techie joined in. I ended in a group of Finnish guys. Talking about things. Things different from IT and work. Thanks P.J. and Jeff for the conferring.